In this large abstract, three discrete areas of colour laid out in triangular fashion are held in tension by an inflected line that recalls the douga, the characteristic yoke of the Russian troika. 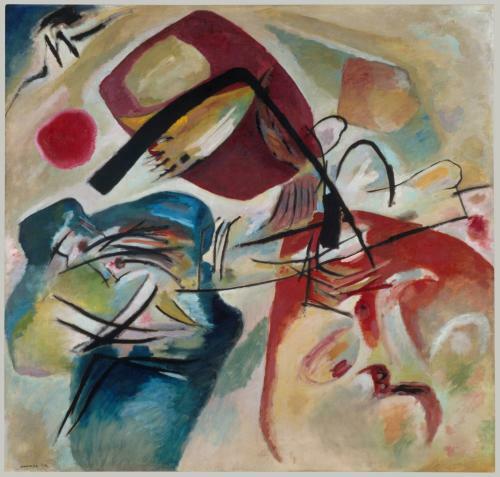 With Mit dem schwarzen Bogen [With the Black Arch], Wassily Kandinsky declares that a painting may be constructed on the basis of dissociation of colour and line and through a dissonance that relates through tension and contradiction not harmony. Discovered in the music of his friend Arnold Schönberg, the principle of dissonance would be central to Kandinky’s work between 1908 and 1914.